If you have not received an informational letter in the mail, which includes information about ways that you may participate in our ministries, please let us know. The NCCW is honored to recognize an outstanding young woman who demonstrates faith, humility, generosity, and kindness through her school, parish, and community involvement. Female parishioners who are currently seniors in high school may apply or may be nominated. Nomination forms are available here, in the back of the church, and at the School and Parish offices. Nominations are due by Monday, April 15th. The nominees and recipient will be recognized at the Madonna Dinner on Wednesday, May 1st. For more information please contact Susan Neuville 651-925-9799, susanneuville@gmail.com. The evening will conclude by 8:30 pm. Kjersti will speak about the importance of inter-generational relationships for young and old. With a Masters in social work and Gerontology from UW Madison, she has worked in a variety of settings serving older adults, including as Director for the Saint Croix County Wisconsin Department on Aging. For the last few years, Kjersti has been at home with her two children (who are students at Nativity), balancing the demands and rewards of being a family caregiver in the middle of the "sandwich generation." 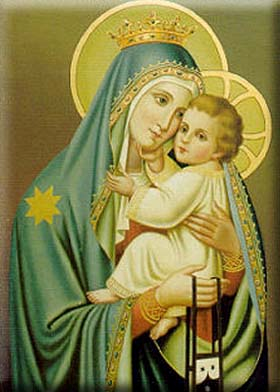 “If we stand with Our Lady, she will give us her spirit of loving trust, total surrender, and cheerfulness."